A plastic jigsaw puzzle is ideal for small children, or for a puzzle that will be used often. We can ensure that your personalised jigsaw puzzle lasts a long time, by making it from plastic. 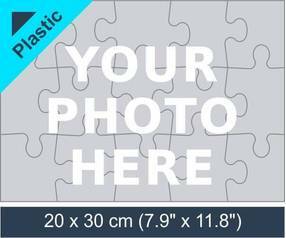 The plastic photo puzzles we make, are identical to our standard puzzles we manufacture from cardboard, but much harder wearing. The only noticeable variation between our standard photo puzzles and our plastic ones, is that they are made from a robust plastic. Upload a photo or image, choose the size of your jigsaw puzzle and you are ready to order! A plastic jigsaw puzzle is a great way to share your photos in a long lasting way. Ordering a plastic jigsaw puzzle is very easy. All you need to do is choose the size of your puzzle, and then upload your photo or image. Finally, decide how many you want to order. It is that simple! A plastic picture puzzle will last much longer than a cardboard one. Each puzzle is cut from 2mm (0.08”) plastic. This means that each piece is very strong, and the puzzle will stand up to frequent use very well. This makes them perfect for children, or to use in an environment where they will be handled often. Our plastic picture puzzles can be ordered in six different piece counts. The puzzle can be fully personalised using your choice of photo or image, you can even add custom text. If you are looking for an interesting, unique promotional gift to give away to clients and business trading partners, then a plastic picture puzzle is a great choice. They can feature your company logo, and each one you give to clients or prospective customers will last a very long time. This kind of promotional gift keeps your business under the eye of the people you give it to. A plastic photo puzzle is perfect for children! Our plastic photo puzzles are completely safe for children to play with. They are robust, so they will not break easily producing sharp edges. Should an accident happen, and something be spilled on your puzzle, you can just wipe it clean, as it is entirely waterproof. Because the puzzle is made from plastic, you can use it anywhere without worry of it being damaged. Take it in to the garden, use it in the back of the car. Anywhere you wish. If you need to keep your children amused whilst at the beach, or anywhere else where it could get dirty, then this is the puzzle you need. A personalised plastic picture puzzle is a great educational present for children. It will keep them amused, and also help them to develop problem solving and motor control skills. Order one today and make your children smile!